The Legendary Pink Dots - "The Whispering Wall"
25 years and Ka-Spel and company are still going strong, recording and what seems like regular touring. The Whispering Wall is the latest from The Legendary Pink Dots and their third on ROIR. "Soft Toy" opens the album on a powerful note, with its pounding beat, wailing Phantom of the Opera organ, ripping guitar from Erik Drost, Niels Van Hoornblower sax riffs and Edward Ka-Spel's trademark vocals. Great song. It rocks hard but weaves its way between moody atmospheric sections too. "Dominic" is a cool track with haunting electro ambience and jazzy edge interspersed with whimsical alien strangeness. "For Sale" is another electronics driven tune and has a Neu! styled quality that I enjoyed. "06" is another solid song that is very much in the standard Pink Dots mold. "Peek A Boo" is a fun tune that sounds like some 60's psychedelic novelty song. Ka-Spel has an unmistakable voice which is difficult to describe to the uninitiated, but "King Of A Small World" stood out as something a bit different, sounding like Ka-Spel's attempt at cosmic avant-lounge jazz. A very cool and strange song. Among my favorite tracks is the 9 minute "In Sickness & In Health", which begins with a few minutes of floating electro-acoustic space ambience before Ka-Spel's vocals are introduced. I love the combination of deep space soundscapes and efx, bits of psychedelia, and the jazz feel that the sax always brings, all the while retaining a hypnotically dreamy quality. "The Divide" is another highlight, opening with sonic mayhem and spoken word narration by Ka-Spel. Freaked out alien synths create a frantic battle-in-space scene while the sax rips off a relentless Van der Graff Generator groove. A great exploratory freakout track. Finally, I'm a bit ambivalent about the 12 minute "Sunken Pleasure/Rising Pleasure/No Walls, No Strings", which has lots of possibilities but ultimately meanders a bit too much without any real direction or cohesion, though I found the last few minutes of peaceful ambient symphonics to be a fitting end to an otherwise excellent set. 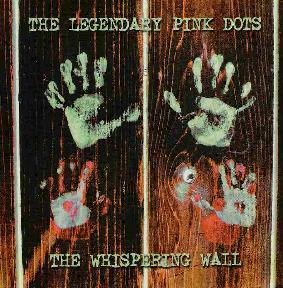 I can't imagine any Pink Dots fan not finding lots to love on this album. For more information you can visit the Legendary Pink Dots web site at: www.legendarypinkdots.org. The Whispering Wall is distributed by ROIR. You can visit their web site at: http://www.roir-usa.com.